A happy news to the Civil Service aspirants in and around CEC! 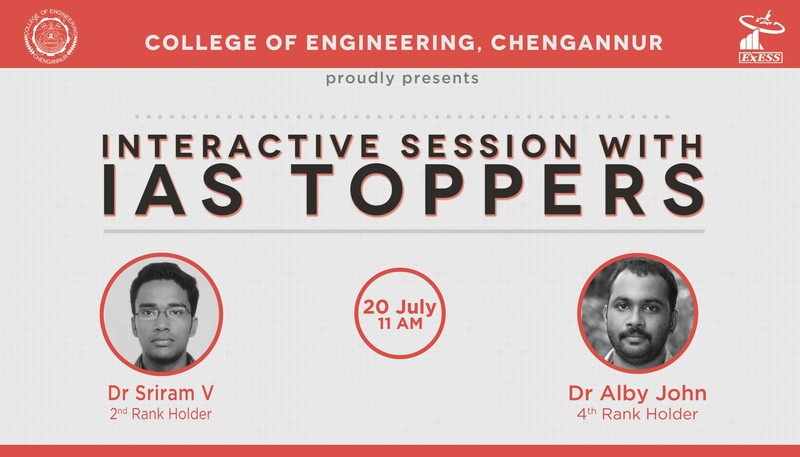 The toppers of Civil Service Examination 2012 – Dr. Sriram V (2nd Rank) and Dr. Alby John (4th Rank) – at College of Engineering Chengannur, on July 20, 2013 at 11 AM, at YMCA Hall, Chengannur. Make use of this opportunity! This event is organized by ExESS, the forum of Electronics Engineering students of CEC. For more details, contact the persons as given in the image. Note that external registrations are permitted. 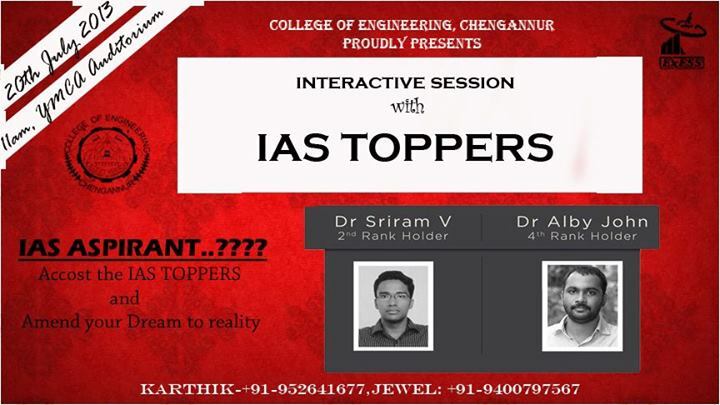 This entry was posted in College of Engineering Chengannur, Exams and Results, ExESS, Other and tagged 2012, CEC, Civil, Civil Service, College of Engineering Chengannur, Dr. Alby John, Dr. Sriram V, Exam, Examination, IAS, IAS 2012, IAS Toppers, Interview, Kerala, Meet, Service, Topper, Toppers. Bookmark the permalink.